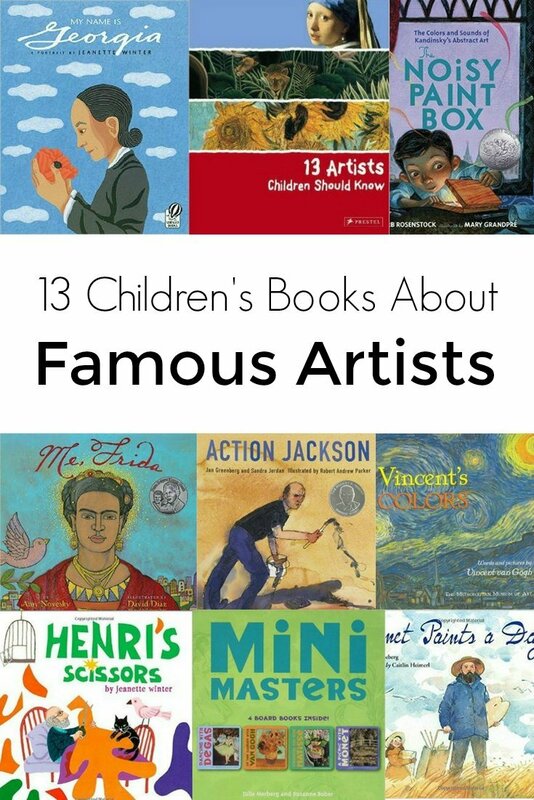 Children will learn about some of the most well-recognized, famous artists with these 13 books. Reading about other people’s lives – how they overcame fears or struggled and showed courage in the face of doubt – give us a glimpse into how someone else has demonstrated characteristics we also aspire to. 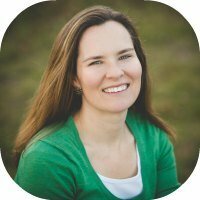 And biographies for kids are no different – knowing that the story they are reading is real makes the message all the more powerful for kids. 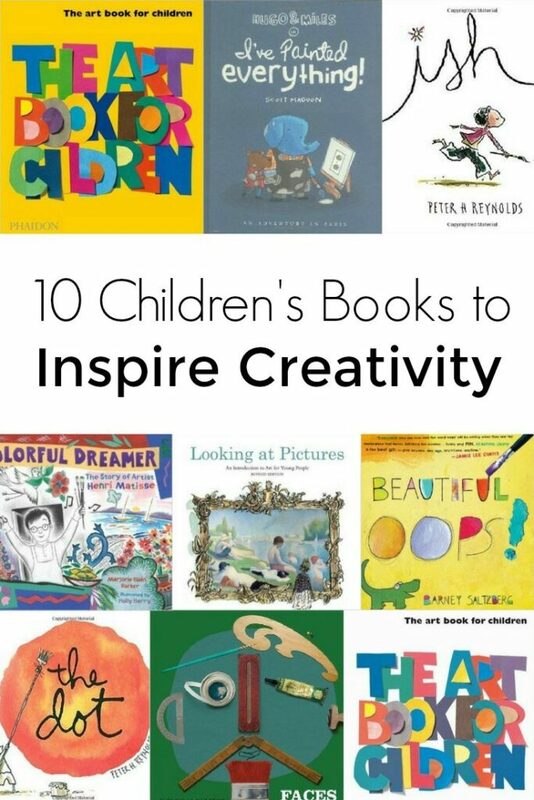 Children’s books about famous artists are full of engaging and educational stories. For one thing, most famous artists weren’t admired or even liked for many years, instead, they had to persevere and remain determined that what they were creating was extraordinary, unique. Take, for example, Henri Rousseau who didn’t begin painting until later in life and was rejected time and again by the academy. Despite experiencing one failure after another, Rousseau continued to believe in himself and finally, others began to see his genius. And then there’s Vasily Kandinsky who fell in love with painting at a young age after his aunt gave him a box of paints. But instead of pursuing art, he at first became a lawyer only to turn back to painting a few years later. After many rejections and disbelief in his work, Kandinsky eventually became the world-renowned artist he is today. 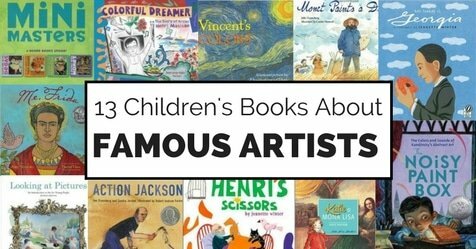 These thirteen children’s books about famous artists are a delight to read. Not only will they expose kids to the names of famous artists but will also let kids witness how each artist approaches the creative process differently, faces their own setbacks and limitations, and finally believe in themselves enough to demonstrate to the world that their art is worth taking notice. 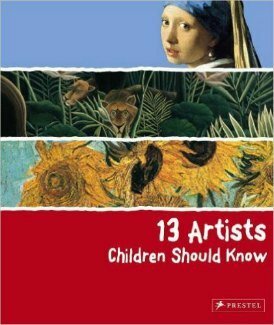 This book is an excellent introduction for young children to some of the masters – Da Vinci, Vermeer, Van Gogh, Matisse, just to name a few. Artists are listed chronologically and in a style that’s appealing to kids. Each description of an artist includes a biography and reproductions of their most well-known art. 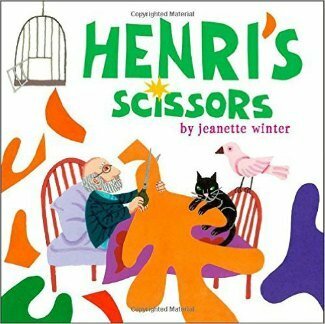 Henri’s scissors follows the story of Henri Matisse as he emerges as an artist but later falls too ill to paint. He then takes up the craft of cutting shapes from colored paper – creating some of his most well-known works of art. 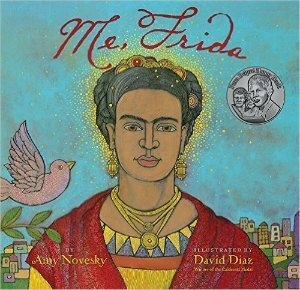 Me, Frida tells the story of Frida Kahlo, a Mexican who moved to San Francisco so her artist husband, Diego Rivera, can paint murals. Frida finds herself bored in San Francisco but eventually begins to paint. At first, her art work isn’t well-received but Frida eventually makes a breakthrough with her work Frieda and Diego Rivera. The story is not only of an artist, but of a woman who, while marginalized by her husband’s fame, is able to become a success in her own right. The Fantastic Jungles of Henri Rousseau tells the story of Henri Rousseau, who first began painting at 40 years old. The book illustrates Henri’s dedication to learning about art, despite having never taken art classes, and his determination to keep perfecting his craft, despite continuous criticism from art experts. It’s not until he’s 61 years old that a few artists begin to recognize the value in his work. 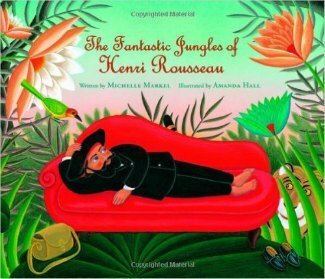 Kids not only learn about this famous artist but also see how staying true to oneself and not letting defeat get in the way allowed Rousseau to become the famous artist he is today. 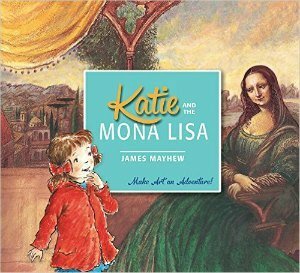 Katie and her grandmother take a trip to the museum where Katie see Mona Lisa for the first time. While Katie is looking at the painting, Mona Lisa begins talking to her and eventually the two look at other pieces of art such as a Raphael, Botticelli, Carpaccio and da Vinci. In each case, the story behind the painting comes alive and possibly making these classic works of art more interesting for kids. 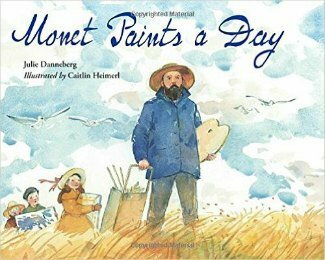 Monet Paints a Day takes the reader through a day in the life of Claude Monet as he paints in Étretat, France. As be wanders over to the beach, and begins to paint we learn the process he used to create a masterpiece, and how different it was at the time from how other artist worked. 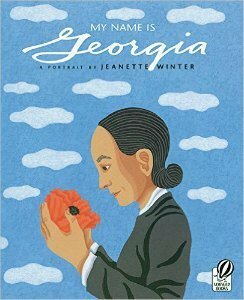 My Name is Georgia takes the reader through the life of Georgia O’Keefe. How she came to discover her artistic expression in Texas, painted gardens and flowers in New York City and later documented her findings in the American Southwest. Anna’s uncle gives tours at the local art museum and today Anna’s accompanying him. She’s been told not to ask questions or touch pieces or ask to go to the bathroom. But suddenly Anna really needs to go to the bathroom so she wanders away from her uncle and begins “talking” with some of the works of art. First, she chats with Rembrandt, then Munch, van Gogh, Picasso, Warhol, Chagall, Cézanne, Matisse, and finally, Pollock. 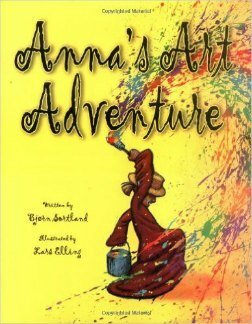 Eventually, Anna finds her way back to her uncle’s group by not before learning a bit about each artist and their creations. 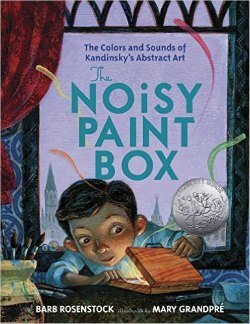 The Noisy Paint Box is a historic fiction story of Vasily Kandinsky and his path to becoming one of the first abstract artists. While the dialogue is imagined, the facts are true – such as Kandinsky’s ability to feel colors as sounds and sounds as colors. Kids see how Kandinsky’s art wasn’t accepted at first but with enough perseverance, persistence, and breaking from the norm he eventually broke through and to become a famous artist. 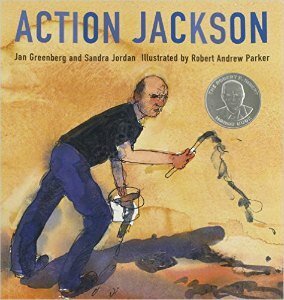 Action Jackson tells the story of Jackson Pollock during the months of May and June 1950 when he painted his famous work, Lavender Mist. Readers are taken through his life, his daily schedule and introduced to Pollock’s unique and unconventional painting style. 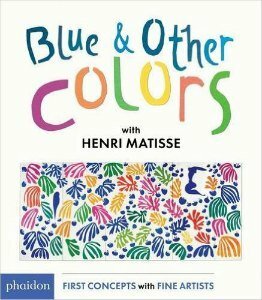 This board book exposes children to a number of Henri Matisse’s famous works of art. Underneath each work of art there are descriptions that highlight colors and patterns in the design. 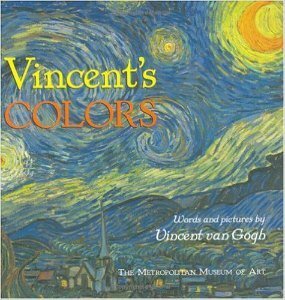 Vincent Van Gogh’s words are placed next to his works of art in this book that exposes kids to a wide range of his masterpieces. 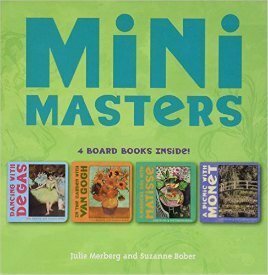 These small board books show the works of art from four prominent painters – Degas, Monet, Matisse and Van Gogh.